Canson® Imagine is notable for its silky texture, in that its natural aspect is maintained, giving it an exceptional feel to the touch. 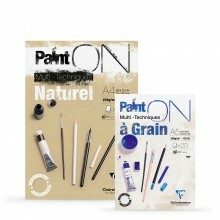 Its texture, absorption capacity and weight (200 gsm) make Canson® Imagine an ideal support for both dry and wet techniques, such as gouache or watercolour. Being pure white in colour, Canson® Imagine gives excellent contrast and provides harmonious colours. A light grain surface suitable for pencil, pastel, charcoal, watercolour, gouache, ink and pen.